What Are Hydraulic Hose Fittings? Hydraulic hose fittings are essential components in hydraulic systems. They connect the hoses together forming an airtight bond allowing the hydraulic system to work effectively. Hydraulic systems need to be airtight so it is important to choose the correct hose fittings. There are many different sizes to choose from which fit many different systems. These are the seven pieces of essential information necessary to select the correct hose fitting. These are; size, temperature, application, media, pressure, ends and duplication or STAMPED. Choosing the correct hose fittings ensures hydraulic systems are efficient and fault free. Incorrect fittings increase the chance of air getting into the system and causing it to fail. There are many different types of hose fittings available from ISN to R13 multi spiral in bore sizes ¼ NB and 2 NB. The complete range includes; BSP, JIC, METRIC, NPT, ORFS and SAE flange fittings in mild steel and 316L stainless steel. Pressure testing of the hydraulic hose assemblies goes up to 830 Bar. Hydraulic hose fittings are an integral part of hydraulic systems which play a major role in all of our lives. Car braking systems, diggers, lifts, rescue equipment, fairground rides and production lines all use hydraulic power systems. Life is so much easier with the power increasing properties of hydraulics. Without them, we would have to use superhuman strength to carry out everyday tasks we take for granted. Hose fittings play a major role in hydraulic systems because they connect all of the hoses together. It is essential the system is airtight for it to work effectively, therefore, choosing the correct hose fittings is incredibly important. Lose hose fittings do not provide an airtight connection resulting in air bubbles in the system. There are so many different hydraulic systems and a large number of fittings available so how do you determine the correct fittings for your system? STAMPED is a system the industry uses to determine the correct hose fittings for hydraulic systems. It is an acronym for size, temperature, application, media, pressure, ends and duplication. You measure the size of the hose by measuring the inner diameter and outer diameter of the fitting. They refer to this as I.D. and O.D. Also any angles the hose is going to be bent into needs to be considered when you measure it as this affects the overall length. Temperature has a profound effect on hoses and results in system failure if the wrong materials are selected. It is important to consider the temperature of the liquid running through the hose and the temperature of the outside environment. Determining the purpose of the hose helps you to select the correct materials for the application. 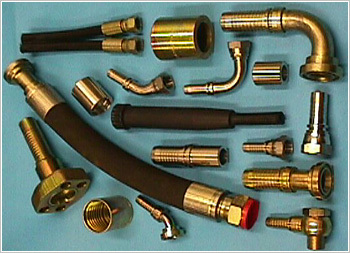 Different types of hoses are suitable for different types of systems. Media is the substance or material that flows through the hose. Some substances contain corrosive chemicals so the hose needs to be resistant to this type of material. Pressure causes wear and tear on hose assemblies so selecting the correct material to withstand the pressure is important. Choosing the correct hose fittings ensures the system works effectively. Taking note of any bends helps to make sure you choose the correct fittings. Being able to recreate an existing system is more economical and cost-effective than creating a new system. If you would like to find out more about hose fittings contact us and we will be able to offer you advice.